In 1986 Los Comales Taqueria Carnes Al Carbon Mexican Restaurant opened on Austin’s east side. Even back then East Austin was chock a block with Mexican restaurants but there is always room for one more, especially when you’re filling a vacuum. In this case, the vacuum was for Norteno-style grilled meats served with charred green onions and lard laced refried beans. Los Comales soldiered along til 1989 when the family of matriarch Graciella Benitez decamped back to Chicago after deciding to sell the taqueria. In 1993 the Benitez family staged a triumphant return to our town and reopened their family restaurant where they’ve been putting out big platters of Norteno-style Mexican food ever since. I remember the heyday well. Back in the late 90s you’d walk into Los Comales and the room would be packed with celebrants drinking and hollering while flames shot up off the big al carbon grill stationed close to the front door. The smell of hot flesh and crisping green onions would absolutely drive you wild while you waited, hopefully waiting for a table to turn so you could have a go at one of their giant, meaty combo platters. With this series in mind I ducked into Graciella’s restaurant earlier this week to take the measure of the Mexican staple; chips and salsa, served as an appetizer, gratis, within moments of being seated. The totopos: Nothing remarkable here. A cut above the standard, low grade version served all over town but little more than that. Made with yellow corn and served at room temperature these are unremarkable. Red salsa: Almost like a marinara. Sweet with little to offer, flavor wise, other than one strong sugar note. 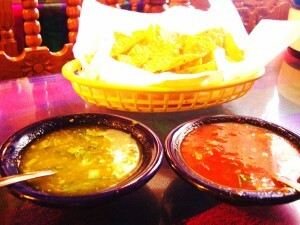 Green salsa: Better than the red. I’m not damning them with faint praise. This thin, tomatilla based salsa verde has a faint chile flavor with a nice background of cilantro and white onion. Whereas before Graciella was almost always stationed near the front door greeting her patrons, that task has now fallen on her daughter Jasmine, a very friendly young lady who walks me through the near death experience of the restaurant being hemmed in by giant machinery during the years long renovation of e. 7th street. Jasmine reports that business is slowly but surely returning to normal. I’m glad to see that the city of Austin’s project to make our town more attractive to tourists cabbing it downtown from the airport wasn’t able to shutter one of East Austin’s finest, longest running houses of Mexican food. This entry was posted in The State Of Chips And Salsa In Austin Texas. Bookmark the permalink.